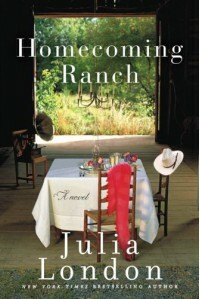 Homecoming Ranch is not your normal man meets woman, they fall in love, happily ever after story. This story is about Madeline Pruett and Luke Kendrick. Madeline is a semi-successful real estate agent in Florida who learns her "sperm donor" father, Grant Tyler left her a 1/3 of a ranch in Pine River, Colorado and two sisters she never knew she had. Luke is an up and coming custom builder in Denver, who comes home to help out his father and brother. Sparks flare when they first meet, but then Luke finds out that Madeline is one of Grant's heirs. Grant had swindled Luke's father out of the ranch that had been in their family for a couple generations. The romance between Luke and Madeline has fits and starts. They each have past relationship issues and have a hard time with trust. One of the more powerful things Luke says to Madeline after finding out that she betrayed his trust, not with another man but with the ranch, is "Relationships, families-they come with lots of flaws and nothing is ever going to be perfect. And if you are going to stand around, hoping that all the kinks and hurt and messy stuff will go away, you'll never know the joy of any of it. You'll be waiting alone for a very long time." Having never had a family, just her alcoholic mother, Madeline has to come to terms with the messy emotions of being in a relationship. All of this is told in brief commentary by Leo, Luke's younger brother. Luke is a riot! He developed Motor Neuron Disease and is in a wheelchair and feeding tube. He doesn't let that get to him though, he flirts and is so charismatic and funny. I can't wait for him to come back in the next Pine River books.